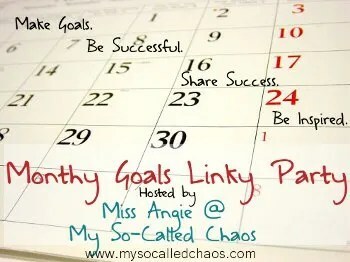 It’s time for the Monthly Goals Linky Party! On the first Wednesday of every month, we write a post recapping our goals from the month before and setting goals for the future month. Then, we link up the post with the linky party and give each other encouragement and support by visiting and commenting! At the end of the year, a super awesome prize will be drawn and awarded to one random blog that linked up goals throughout the year! To link up with the hostess and join in click the icon above and jump on board! Walk 5 times a week, rain or shine if outside, or inside on the treadmill, but walk and be up to 3 miles a day by the 30th of the month! FAIL! but not giving up! Drink 64 ounces of water every day (I’ve been easily dehydrated for months). SUCCESS! Eat breakfast every day. (candy is NOT breakfast) SUCCESS!!! Start measuring portions on all food! Stop over eating. SUCCESS!!! 8 new team members to my Avon business by the 30th. FAIL! But my car was in the shop so hard to get out there and work it. Okay so 4 out of 7 isn’t too bad, better than 50%! 🙂 But I am going to keep those that I did not make on the list for December. Walk 5 times a week, rain or shine, inside or outside, but at least 10 minutes a day and work up to 3 miles a day by the end of the month. Less coffee and more herbal tea! 8 new team members to my Avon business. Continue to track myself daily on SparkPeople.com and not slack off like I have in the past. Take off at least another 6 pounds by the end of the month. Get my walk-in closet organized and in order and keep it that way! Daily devotions and bible study – every single day! Make it to church every Sunday this month. You did really well for November, and I love how you’re not giving up on the goals you didn’t complete! Great job! You can totally conquer December! Thanks for linking up! Thank YOU for hosting, I LOVE it!